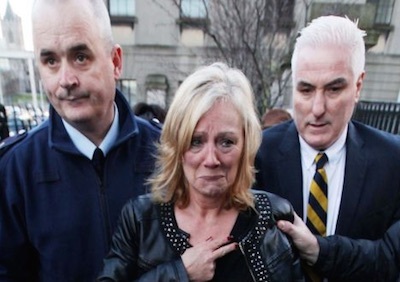 Today, just two weeks before Christmas, a law-abiding mother, daughter, sister, grandmother and friend to many, one Claire Knowles, was committed to prison by Judge Sean O’Donnabhain in Cork Circuit Court. Her crime seems to be that she was in ‘flagrant breach of a Court Order’ and it seems she was also guilty of being ‘brazen’, even though to observers she tried to defend herself in a most calm, polite and assured way. Claire is what is known as a lay litigant. She represents herself, and has done so for several years at this stage in both the Circuit Court and the High Court, to answer the claim that is being brought against her. Of course, like so many tens of thousands of people in Ireland, the claim is to do with a mortgage issue; in Claire’s case the mortgage being on her family home. Claire has always worked hard. The financial history of how she got to the position of defending her family home in Court is not so unique and therefore is not central to events today. What is now far more relevant and serious is the reasoning and logic used by the Judge when sending Claire to prison this evening. There is a concept in law known as a ‘Void Order’. It is recognised in Common Law jurisdictions. At its most basic it means there is no Order of a Court if the Court is found to have acted outside its jurisdiction in the Granting of the said Order. Claire has gained much rock solid evidence that an Order, as handed down by the Circuit Court in Cork that granted possession to ICS Building Society of her family home on 20th January 2014, is a Void Order on multiple provable grounds. Indeed Claire was in the High Court just yesterday, 7th December, and won the right to have an appeal heard of this Circuit Court Order sometime in the New Year, with the view to getting it officially declared Void. Claire it seems was ‘brazen’ for even mentioning this information today to Judge O’Donnabhain. He completely ignored the fact that she has an appeal yet to be heard in the High Court and informed her that the High Court did not have jurisdiction while he in fact did. Claire was evicted on the 22nd September of this year from her home. She was encircled and intimidatingly frog-marched out by many Security men who acted under the instructions of Cork County Sheriff Sinead McNamara. Claire re-occupied her home thereafter. It seems this act of occupying her home is what the Bank has now used to successfully get Claire sent to prison, even though the Order used by them to gain Possession – and now imprisonment – was and remains void. Many witnesses heard Claire Knowles state today in open Court, before she was jailed, the many ways in which her Order was void. All that she stated is provable and not only that, it was all submitted by way of affidavit to the Courts and to the Plaintiffs. She also has both a High Court Judge and the Master of the High Court granting her leave to appeal that initial Order. Claire went to court today in the now false belief that she could not go to gaol as the High Court have vindicated her right to appeal. Yet Claire sleeps in Limerick prison tonight. A gun was put to her head today by the Judge. She was instructed that unless she took the Order seriously and arranged to hand over the keys to her home he was committing her to prison. Could this be viewed as an abuse of process to intimidate? Claire would not be coerced in such a way and said she would not give consent and re-iterated that the initial Order was void and wondered how could she be in contempt of an order that did not exist? She was jailed. This is Justice in Ireland in 2015. If you catch the Banks and their agents out you get an endless array of overpaid Barristers and Solicitors thrown at you in order to break you. Claire Knowles will not be broken. It seems the bank and agents for the Bank may have been on very questionable grounds for evicting a woman from her home on a void order. The pressing question is where does their liability now stand for subsequently getting her jailed on a void order? The Tomás Mac Curtain Society, with the 1916 Societies overall, stand full square with Claire and demand her immediate release.